Careful attention to the health of the mare should be a priority before breeding takes place, during the pregnancy, and following parturition. Good nutrition,including necessary feed supplements, adequate exercise, and attention to physical condition are all important. Making sure the mare is parasite-free and up-to-date on vaccinations is also important for the ongoing health of the mare and the well-being of the newborn foal. Moving the mare to a well-lit,clean,dry,and warm foaling stall weeks in advance of delivery will allow the mare to become comfortable with her surroundings. 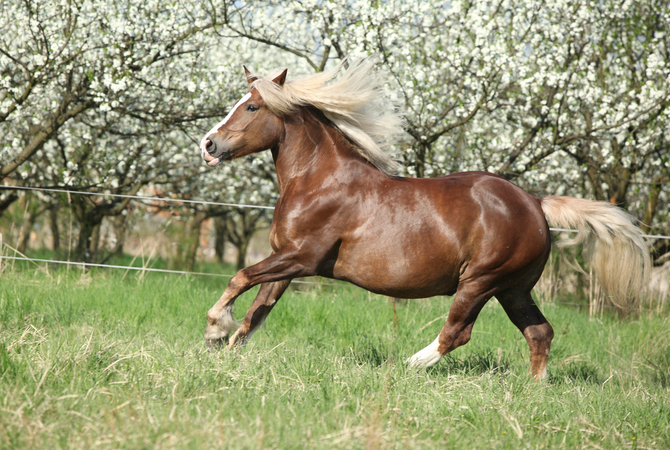 The mare should be taken to the foaling location two to three weeks before foaling is expected to occur so that she will be comfortable in her surroundings. Research indicates that the mare produces antibodies against the pathogens in this new environment, which are then passed on to the foal in the colostrum,giving the foal passive immunity for a number of weeks after delivery. If a box stall is chosen, it should be large enough for the mare to lie down and for any attendants to move about as necessary. The stall should be sturdily constructed, free of any sharp edges, and have good ventilation. 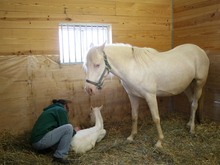 With careful preparation, foaling usually proceeds without problems. Having the necessary supplies on hand, a clean, quiet area for foaling, and contact information for the veterinarian readily available will lead to a non-stressful parturition experience. Everyone can sit back, relax, and enjoy the antics of the newest addition to the family!